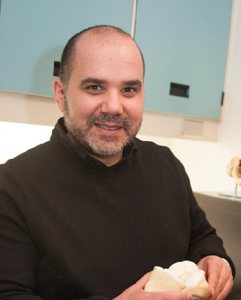 Dr. John Theodoropoulos earned his Medical Degree at Queen’s University and completed his residency in Orthopaedic Surgery at McGill University. He completed a Fellowship in Sports Medicine at the University of Illinois Chicago and completed a Masters of Science in Cartilage Regeneration at the University of Toronto. Dr. Theodoropoulos is an active staff member of the Division of Orthopaedic Surgery of the Department of Surgery at Mount Sinai Hospital and Women’s College Hospital. His strong interest in teaching residents has earned him several teaching awards from the Department of Surgery at McGill University and many invitations to speak and present at continuing education seminars. As a distinguished and invited speaker, presenter and lecturer, he has contributed locally, provincially and nationally at meetings and conferences on topics such as ACL reconstruction, cartilage repair and tissue engineering and arthroscopic shoulder repair. He was a physician for the Men’s hockey tournament at the Vancouver 2010 Winter Olympic Games and consults for several professional and amateur teams throughout the city.